HERE IS A GREAT 33 WATT COMMERCIAL QUALITIY GUITAR AMPLIFIER/SPEAKER BOX AND STAND COMBO WITH EXCELLENT SOUND VERY SUITABLE FOR YOUR MUSIC ROOM. I'M THE SOLE OWNER. I BOUGHT THE BOGEN AMPLIFIER IN 1955 FOR MY GIBSON CONSOLE GRANDE STEEL GUITAR AND USED IT FOR ABOUT TEN YEARS WITH A HOME-BUILT SPEAKER CABINET. WHEN I MOVED, I DISCARDED THE SPKR CABINET BUT KEPT THE AMP FOR NOSTALGIA. 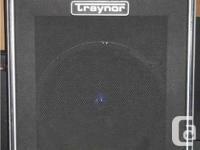 A FEW YEARS AGO, I BOUGHT THE TRAYNOR YCX12 EXTENSION SPEAKER CABINET TO HOOK UP TO THE BOGEN AMP FOR SHOW PURPOSES ONLY IN MY MUSIC ROOM. THE CABINET HASN'T EVEN BEEN USED AN HOUR. ((I HAVE SEVERAL OTHER AMPS WHICH I USE WHEN I PLAY OUT. I'M NOW APPROACHING 77 AND WISH TO DOWNSIZE SOME OF MY MUSIC EQUIPMENT). I HAVE THE ORIGINAL MANUAL FOR THE BOGEN. THE STAND IS A ROLLAROUND TV STAND AND IS INCLUDED IN THE SALE. IF YOU'RE LOOKING FOR A GREAT INSTRUMENT AMPLIFIER FOR YOUR MUSIC ROOM, YOU WILL BE HAPPY WITH THIS BOGEN COMMERCIAL QUALITY UNIT. THE SET IS AVAILABLE FOR PICK UP IN ST. CATHARINES, SORRY, I CANNOT SHIP OR DELIVER. THE PRICE IS FIRM PLEASE AND NO TRADES PLEASE. YOU MAY CALL MY CELL PHONE . THANKS FOR LOOKING AND HAVE A GREAT DAY FROM JOLLY JACK! !